Less than two years ago as part of our application process to become an Apple Distinguished School, we published iMercy to iTunes. 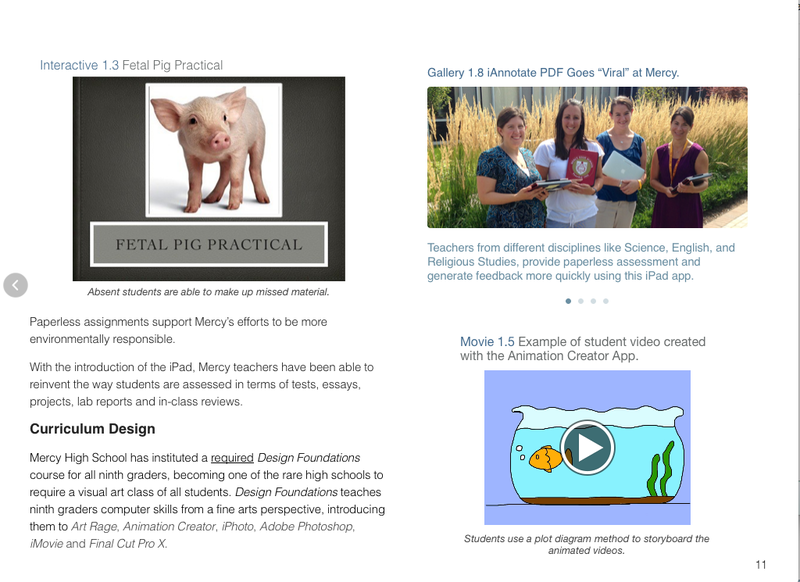 iMercy is a 27 page multi-touch book which describes our school’s technology program. Unsurprisingly, a number of significant changes have occurred over the past two school years, so we would like to reflect these in an updated edition of the book. Some of us are going to collect new data with and ISTE Standards based survey on how our students use their iPads for school after three years of experience. Others will review the five chapters of the the book to consider what to weed out and what to update. We hope to have the new edition updated by mid-July. Of course I will keep you posted! * Project team members: Angela Harris-Schultheis, Ann Lusch, Carol Shea, Dr. Kreger, Christopher Blitz, Colleen Rozman, Cindy Richter, Julie Earl, Lisa Schrimscher, Cheryl Corte, Susan Smith, Alison Kline-Kator, Tom James.